Ford Mustang owners have been notorious for causing problems before, during, and after car meets, and we’ve found yet another example that reinforces the stereotype. In the case of this video, the owner was showing off his ability to bang the rev limiter for nearly two minutes straight during a donut session at a late night car meet. It didn’t end up as planned, and the owner was left with only a portion of his Ford Mustang GT. 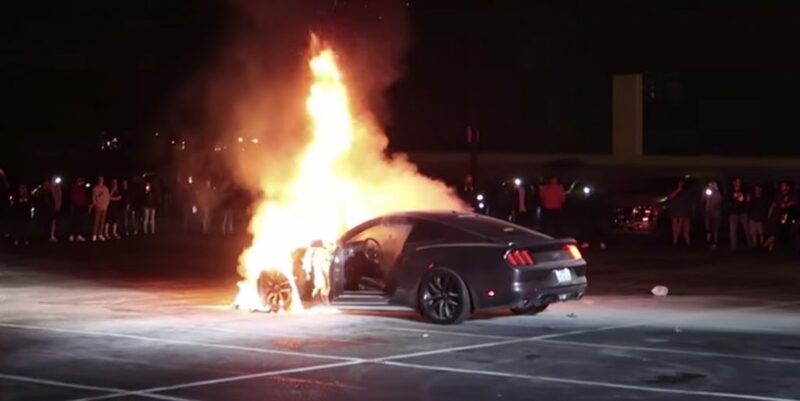 In an attempt to kill the tires on his Ford Mustang GT the owner ended up setting his poor pony car on fire, and then watched it burn to the ground. There are many lessons to be learned on the internet, and this video is a prime example of what not to do with a Ford Mustang at a car meet – or any car for that matter. The video was filmed in Westlake, Texas earlier this month and very little detail was given about the car or owner, but it appears to be an S550 Ford Mustang GT with some sort of aftermarket exhaust setup. The 5.0-liter Coyote V8 sounded great, right up until it caught fire and began to burn. The 20 minute video is difficult to watch, as spectators attempt to toss minuscule amounts of water on the car. Later they tried small fire extinguishers. Finally, they worked up the sense to call the fire department. By that point the car was a lost cause, which, is very sad to see, but could have easily been prevented.